The Hawizeh Marshes have been populated for more than 5,000 years. The Hawizeh Marshes are by the Tigris and Euphrates rivers in present-day Iraq and the Karkhen River in present-day Iran. 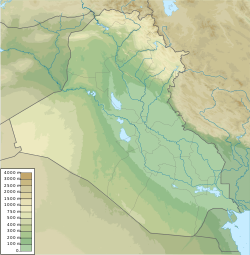 The Marsh Arabs live in Iraq and Hawizeh people live in Iran. From the time of the Sumerians and Babylonians the people used the marshes as a place to live. In the south west of Iran and the south east of Iraq, the Hawizeh and Hammar Marshes are made up of many smalls cities. These cities in the marshes are part of both countries with no border that separates them. So the people can move between Iraq marshes and Iran by the small boats. The city of Marshes were built on water. The people who live there have very simple lives. They make their houses of the reeds of the water without, electricity or cars and they don’t have an education they have just simple lives. The population depends on nature. They fish, hunt, cultivate and breed buffalo. The people use small boats called Al-Mshhove to move. The area where the fresh waters gets to the marshes is far away from the cities. The marshes make a safe home for thousands of migrant animals and birds like “wild squirrels, white eagle, hawks, brown dukes and squirrels every year. So it is a safe home to a lot different kinds of migrant animals who come to raise their young there. The marshes started a long time ago. Around 5,000 years ago, the marshes started by the great rivers Tigris and Euphrates by collision impact. These rivers flooded the land to create the marshes and started a new ecosystem with new animals, birds, fish and plants. That made a great change in that time to original Sumerians and Babylonians who lived there. They lived off the marshes by fishing, hunting and planting. The people came to live in the marshes also, but time changed some of the people’s ideas and beliefs. With the break between the Shia and Mandaean forms of religion, the Shia Muslims came to dominate in the marshes. Some ideas of the original people changed because of this religion and the other ideas remained from the Sumerians. These ideas include fantastic stories about ghosts, curses and extraterrestrials. 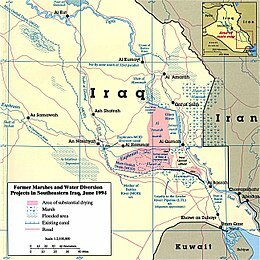 In 1990-1992 when the Iraq government decided to dry the marshes because they thought an armed group lived there, the population left. After the government decided to dry the water, some of them moved to the cities and the others moved to Iran. After the war in 2003 the Iraqi government open the water the marcher people returned to the marshes. Mashers are now true people of marshes around 5,000 in all of Iran and Iraq and the people like the all different kind of birds what came to marshes they are from different religion like Shia Islam, Mandaeism they have a different ceremony of marriage or believe the life together from long time ago and share the marshes. ^ "Hawizeh Marsh". Ramsar Sites Information Service. Retrieved 25 April 2018. ^ a b c Partow, Hassan (2001). The Mesopotamian Marshlands: Demise of an Ecosystem Technical Report, UNEP/DEWA/TR.01-3 Rev. 1 (PDF). Geneva: UNEP Division of Early Warning and Assessment / International Environment House. ISBN 92-807-2069-4. ^ Morrison, John. “Tigris-Euphrates alluvial Salt marsh. Worldwildilife. World wildlife. N.d.Web.30 Apr. 2015. This page was last edited on 10 May 2018, at 14:26 (UTC).